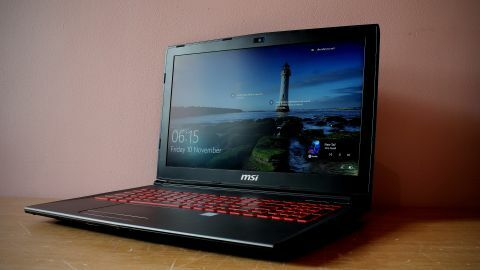 The MSI GV62 7RC-225UK is an unconventional gaming notebook. For starters, it costs just $1,085 (about £829, AU$1,414) – and MSI has built it for esports rather than the biggest and best new games. The machine’s esports ambitions come from a new Nvidia chip designed for these popular and undemanding titles, and the rest of the machine serves up a solid mid-range spec. But is the MSI GV62 7RC too cheap to be cheerful? The model we’ve reviewed is the MSI GV62 7RC-224UK, and it’s the pricier of the GV62 variants. The more affordable machine is the GV62 7RC-225UK, which costs $1,015 (about £769, AU$1,325). It’s got most of the same components as our review laptop, but it ditches the SSD and relies on its hard disk – so game loading times will be slower. MSI is also selling 17.3in versions. The GV72 7RD-833UK costs $1,187 (about £899, AU$1,548) and deploys a GTX 1050 graphics core, an i7-7700HQ processor, 8GB of memory and a 1TB hard disk with a 1080p screen. The GV72 7RE-1283UK costs $1,319 (about £999, AU$1,721) and uses a GTX 1050 Ti graphics chip and adds a 128GB SSD. MSI’s machine doesn’t break any ground, but it looks the part. Its brushed, gunmetal finish is brighter than the black metal used on many other machines, and it’s accented with red: there’s an MSI logo on the lid, a red keyboard backlight, red vents at the rear and extra color on the trackpad. The solid aesthetic is paired with good versatility. It’s got two USB 3 ports and a USB 3.1 Type-C connector, a DisplayPort output and a card reader, and the inside has dual-band 802.11ac wireless, Bluetooth and Gigabit Ethernet. That versatility extends to the hardware: the base panel can be removed to allow access to the storage, cooling gear and memory, and there’s a second memory slot free. You don’t get that kind of access with the locked-down Dell Inspiron 15 7000 Gaming, which costs $1,065 (about £810, AU$1,390) for its entry-level model. In other areas, though, the MSI is inconsistent. The 2.2kg weight is great, but it’s 35mm thick once its rubber feet are included. That makes it lighter than the Dell, but significantly thicker. Build quality isn’t great: the plastic base is too flimsy, the keyboard can be easily pushed, and flexing the screen makes the desktop distort. It’s not a terminal issue on an affordable laptop, but we’d invest in a protective sleeve.